Buffing and polishing takes skill to create an even finish on the floor. Uneven or bumpy areas soak up stains and sealants - and can leave unsightly dull or dark patches. Floors are rarely conventional in shape - so we use edging orbitals and buffers and handtools for awkward corners. We also remove all ugly traces of bitumen or ‘Victorian’ style black wax on the floor. 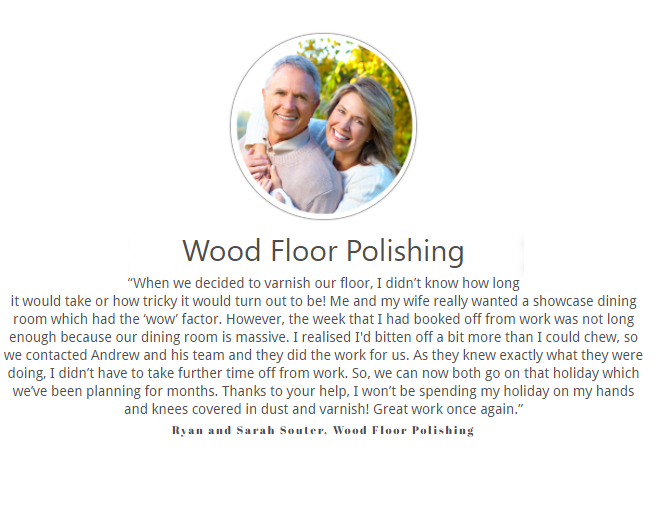 Prepare to polish your wooden floors! What is it about a beautiful, polished, natural wooden floor? The gloss and the sheer warmth – for an alluring welcome..
Or the way it reflects light – in harmony with the sun and the universe, the provider of energy and supporter of life. Apart from good looks, a wooden floor is durable, easy to maintain and to keep clean - the most hygienic choice in the home or office. To attain this desirable state does require maintenance – with too many floors left to a sad and dreary decline. 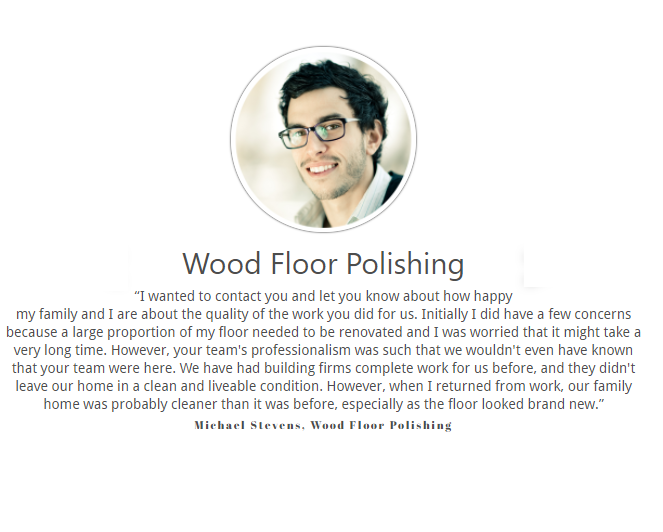 Get help from Wood Floor Polishing Co.! Floor sanding is the first stage in renovating a wooden floor back to its original condition. And with the large choice of modern floor products, you could well enjoy a floor that is superior to the original version. At a modest cost compared to a new floor or - dare we say - covering the old one with carpets. 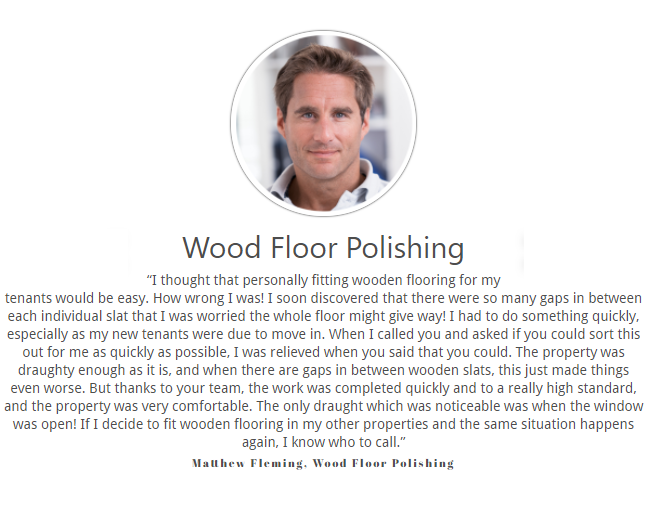 So if you have an underappreciated floor - at home or in your office, school or business - call on Wood Floor Polishing Co.
We work on all kinds of floors throughout Greater London and the Home Counties. Sandpaper. It's a simple thing but it's the key to getting the finish you want on your wooden floors. Ranging from coarse to fine grits,each has its purpose in creating the kind of professional wood floor sanding finish that adds a real wow factor to your home. It's easy to skip this stage, but once you understand what each grade of sandpaper does you'll understand why it's crucial not to. Each grade of sandpaper cuts into the floor, from the initial coarse cuts that remove the old finish to the subsequent ever finer cuts that remove the scratches left by the previous grade of sandpaper until you have a perfectly smooth surface. You'll always start with a coarse grit as this is the most effective way to remove scratches, damage and old varnish. But this grade also leaves the deepest scratches, so if you then jump to a fine grade you'll never get rid of them because the sandpaper simply isn't coarse enough to cut through. The exact number of grades of sandpaper you'll need vary with the floor you're refinishing, but a minimum of three cuts is generally recommended - coarse, medium and fine grits that will progressively polish out the marks left by the previous grades. When determining the grades of sandpaper you need to use, it's a good idea to work backwards from the finest grit. So,for example, if you've decided to do three passes with the sander and you're using a 100 grit sandpaper for the final pass, your sequence could be 40-60-100. To make sure you have the correct grit sequence, start by doing a test patch using your coarsest grit of sandpaper. If the area is completely clean and bare, then you've chosen the right starting grade and you can work through the rest of the sequence accordingly. To create the perfect finish once you've finished with the drum and edge floor sanding equipment, you'll need to finish with a buffer and 100 or 120 grit paper that puts a consistent and even finish across the floor ready for varnishing or polishing.